The unmistakeable starting gate style of George Hunter, 1965 style. George is the all-time highest Monarchs' points scorer from a total of 13 seasons with the club. 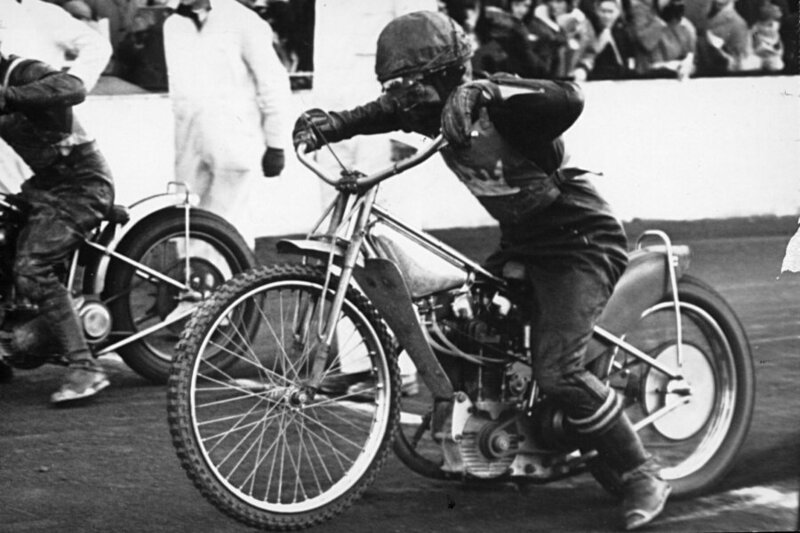 He first rode speedway in 1958 at Motherwell, having previously raced on the Scottish grass tracks. When he was part of the Monarchs' revival in 1960 he was still very raw, but gradually rose to become one of the best Provincial League riders. When the leagues joined in 1965 he was for a while one of the top three or four men in the new British League, though injuries slowed him a little. He stayed with Monarchs till 1969, then moved to Newcastle and then a very successful spell at Wolverhampton. Then it was Oxford, back to Monarchs in 1980, Berwick 1982 and finally Monarchs again, enjoying a 25-year Testimonial in 1983. Highly skilled, a great character and a true Monarchs' great.